Edgar Villchur (born May 28, 1917, New York City, died October 17, 2011) was an American inventor, educator, and writer. His 1954 invention of the acoustic suspension loudspeaker revolutionized the field of high-fidelity equipment, providing better bass response than was previously possible, at the same time radically reducing the size of the cabinet. 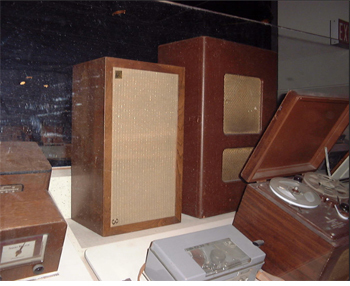 His AR-3 speaker is on display in The Smithsonian Institution’s Information Age Exhibit in Washington, DC. Acoustic Research, Inc. (AR), of which he was president from 1954 to 1967, manufactured high-fidelity loudspeakers, turntables, and other stereo components of his design, and demonstrated their quality through “live vs. recorded” concerts. The company’s market share grew to an unprecedented 32 percent by 1966. After leaving AR, he went into hearing aid research and developed the multichannel compression hearing aid, whose basic design has become the industry standard for hearing aids. Edgar Villchur received his Bachelor’s and Master’s degrees in art history from City College in New York City. He worked in the theater and had plans to be a scenic designer. World War II changed those plans, and he was trained by the US Army in maintenance and repair of radios, radar, and other equipment. He was stationed in New Guinea, where he rose to the rank of captain and was in charge of the electronic equipment for his squadron. 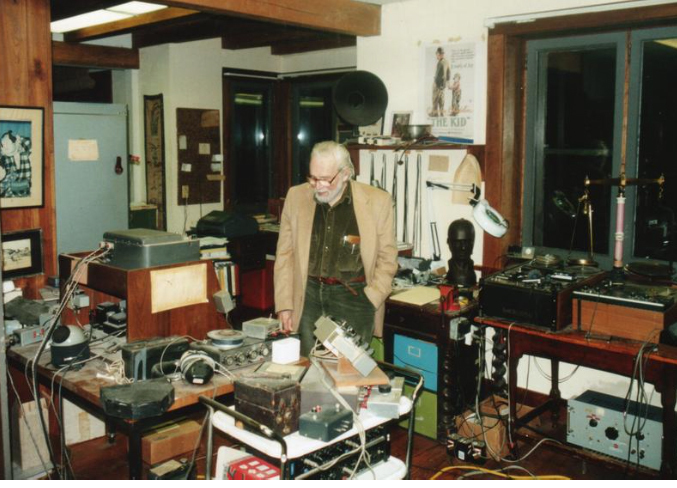 After the war, Villchur opened a shop in New York’s Greenwich Village where he repaired radios and built custom home high fidelity sets. He continued to educate himself in the area of audio engineering, taking courses in mathematics and engineering at New York University. After submitting an article to Audio Engineering magazine (later renamed Audio), he was asked to write a regular column. Despite the fact that his Masters Degree was in Art History, Villchur applied for a teaching job at NYU in the mid-fifties, presenting the administration with an outline of a course in Reproduction of Sound. His proposal was accepted, and he taught that course at night for several years. This was the first time such a course had been offered anywhere. At the same time, he worked at the American Foundation for the Blind in Manhattan, organizing their laboratory and designing or redesigning devices to make it easier for blind people to live independently. The tone arm on the turntable made by the Foundation had 12% distortion. Villchur redesigned it so that the distortion was less than 4%. Villchur recognized that the weak link in home equipment was the loudspeaker. Amplifiers, record players, tape players, and tuners were fairly faithful to the original sound, but speakers of the time were unable to reproduce the bass notes of records or tapes without distortion. 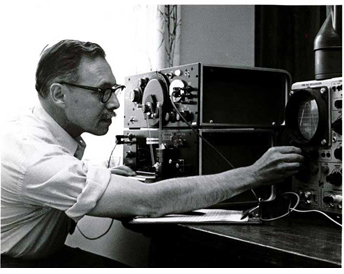 He came up with the idea for a new form of audio loudspeaker, one that would greatly reduce distortion by replacing the nonlinear mechanical spring with a linear air cushion. This “acoustic suspension” design demonstrated a greater undistorted SPL (sound pressure level) at 25 Hz than any previous loudspeaker type, including bass reflex, infinite baffle, or large horn designs. He built a prototype of his new speaker out of a plywood box. His wife, Rosemary, who had been a draftswoman during the war, sewed the pattern for the flexible surround out of mattress ticking. Unable to afford the full services of a patent attorney, he found a patent lawyer who was willing to explain the patent process briefly, and Villchur applied for a patent himself. In 1953, he received US Patent No. 2,775,309 for the acoustic-suspension loudspeaker. He tried to sell the idea to several loudspeaker manufacturers, but his idea was rejected as impossible. Next -> Acoustic Research Inc.
~Photo credits top to bottom: Tom Tyson, Rosemary Villchur, Tom Tyson, and Tom Tyson.